I’m reading what I consider the best book on achieving financial well-being. 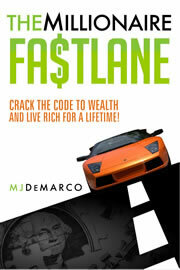 It’s called The Millionaire Fastlane by MJ DeMarco. Let me preface by saying this book has 121 Amazon reviews of which 110 of them are 5 stars. There isn’t a single 0 star customer review. You will not find that with any other book! Not the soon-to-be blockbuster The Help, not The Great Gatsby, not To Kill a Mockingbird. Seriously. Who gives the misunderstood, yet lovable Boo Radley a 0 star review? Any-boo-who. Like The Secret (of which I’m a big advocate), this book is changing my life. I say ‘changing’ because I’m only half-way through. It’s a complete mind-shift from everything we are taught: go to school, get a job, sock money into your 401k, and retire when you’re on the verge of death—that is, if death doesn’t take you down first. Who wants to retire at the age of 67? And by the time we’re 67, that threshold will have increased. Shoot me now. 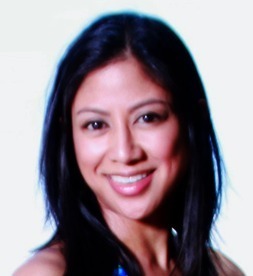 MJ DeMarco talks about how you’re never going to get rich working 9-5 or any job where your financial reward is contingent on the hours you put in. I’ve always known that. I know I can’t retire early if I keep working for a corporation. I’ve just never had the confidence or the creativity to be entrepreneurial. This isn’t in the book, but my mind has been ticking and I am seriously considering retiring in a foreign country or someplace cheap. Y’all can come over for some BBQ! Here is an excerpt. The guy is funny which makes this book an easy entertaining read. “Listen to the same old tired gang of financial media darlings and your financial future blows carelessly asunder with the tradewinds of the markets on a sailboat of HOPE. If this is your plan, you need to be worried. As many discovered too late, their plan hopes you win a dangerous bet…Their plan hopes you can get a job. Their plan hopes you don’t get laid off. Their plan hopes the stock market doesn’t crash and wipe out most of your savings. Their plan hopes your company doesn’t go bankrupt while taking down your pension with it. Their plan hopes your 401(k) doesn’t tank in a recession. Their plan hopes you’re alive after 40 years so you can actually enjoy your wealth because golly gee, you’re going to be the richest guy in the retirement home! He includes the first few chapters of the book on his website. Check it out.